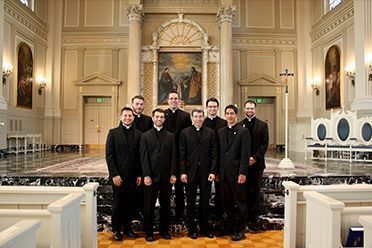 A diocesan priest in the Archdiocese of Seattle belongs to the body of priests of this archdiocese, which covers the area between Canada and Oregon, from the Cascade Mountains to the Pacific Ocean. A diocesan priest normally serves within the boundaries of his diocese under the authority of his bishop. A diocesan priest does not make the solemn vows that religious priests (and religious brothers and sisters) make but he does make promises of obedience, celibacy, and a life of simplicity. A diocesan priest lives a life more like that of his people: he buys his own clothes and car, he pays taxes, he may own personal property. That is why a diocesan priest is sometimes called a secular priest (from the Latin saeculum, a word that means roughly “this world of time and space in which we live”). Because they want to serve God within the Church, diocesan priests make a formal promise of obedience to their Bishop. It binds them to do what needs to be done, as seen through the eyes of the Bishop who is responsible for the entire Diocese. On the other hand, diocesan priests can testify that there is great freedom to be creative in the priesthood. Bishops rely on priests along with the laity to suggest necessary pastoral initiatives. A Bishop also tries to match his priests with the work that needs to be done. Ordinarily, a priest ends up doing work for which he is well enough suited.